SALT LAKE CITY, Feb 18, 2012 – TD Ameritrade, Intersport and QWASI announced the launch of Mobile Pix Campaign which provides TD Ameritrade clients with a way to remember their day with TD Ameritrade and the TD Ameritrade Olympians. This campaign focused on the deliverability of quick points of engagement with fans and participants at each event through pictures with an Olympian. At most events, the Olympians will not be present, but through QWASI’s Mobile Pix, the athlete appears in photo opportunities throughout the venue. The participant will stand and pose for their photo to be taken by special devices that superimposes stock images of Olympians into live shots of participants within one of up to five preselected settings. The final photo will place the person with the Olympian of choice and have it sent to him/her via their cell phone or Facebook. The service allowed participants to take a selfie with their broker and the Olympian of choice. The participants used their devices to design the photograph, then received it as a text to their to share into social media, and also received a take-home freemium. The branded photos provide valuable exposure for TD Ameritrade and an opportunity for TD Ameritrade to expand their community of engaged consumers. 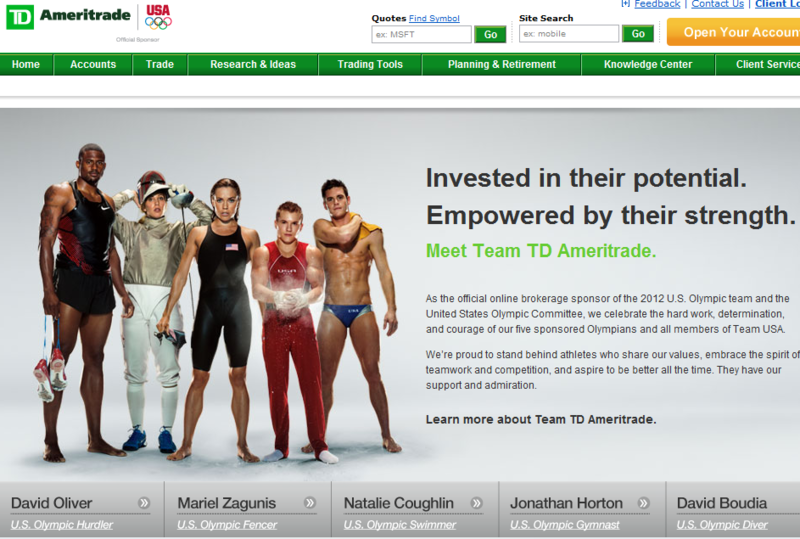 TD Ameritrade is sponsoring the 2012 Summer Olympics in London. During the months leading up to the event, TD Ameritrade plans to host several events in the US to promote their participation and sponsorship of the games and several athletes. Each athlete has been carefully selected by TD based on several criteria that best aligns each one with the brand. Millions of investors and independent registered investment advisors (RIAs) have turned to TD Ameritrade’s (NYSE: AMTD) technology, people and education to help make investing and trading easier to understand and do. Online or over the phone. In a branch or with an independent RIA. First-timer or sophisticated trader. Our clients want to take control, and we help them decide how – bringing Wall Street to Main Street for more than 36 years. TD Ameritrade has time and again been recognized as a leader in investment services. Please visit TD Ameritrade’s newsroom or www.amtd.com for more information. Since 2004, QWASI has been providing mobile marketing consultation, strategy, applications and services to Fortune 500 companies and clients. QWASI is on the forefront of mobile powering mobile interaction and custom messaging services through a high-capacity mobile marketing and messaging platform. The full-suite of services offered ranges from mobile marketing, mobile search, mobile publishing to mCommerce and mobile corporate communications. Customers include AAA, COX, Coldwell Banker, First American, Harte-Hanks, NRT, Prudential and QVC.